Pregnancy and overheating during sleep, The CLIMSOM mattress topper keeps you cool and calm at night. Pregnancy and overheating during sleep? The CLIMSOM mattress topper keeps you cool and calm at night. For the first time, this innovative product allows you to cool the place where you sleep: the surface of your mattress. The 2 to 3% pregnant women each year are regularly searching for solutions to cool off at night. Hot flashes and night sweating are temporary, normal phenomena that the CLIMSOM mattress topper can help reduce. Pregnant women are careful to avoid any extreme situations that could harm the unborn child. 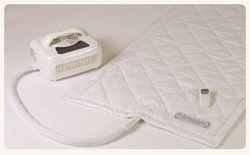 The CLIMSOM mattress pad can help them find a cooler, more comfortable temperature at night. Your own comfort will be your best guide to know the ideal temperature of sleep which is personal you. By limiting the night sweats, it also decreases the risk of dehydration as well as the proliferation of mites for the well-being and good hygiene every pregnant woman deserves.